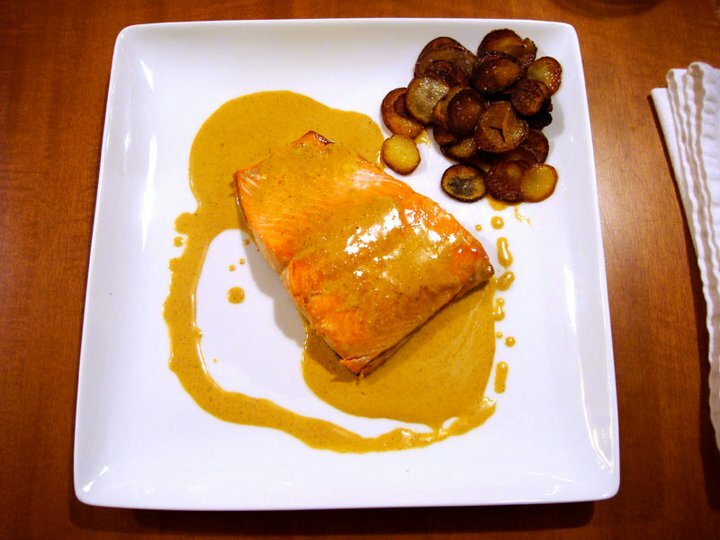 Salmon with Shrimp and Apple Smoked Bacon Sauce – Top Chef All-Stars Night | Eat.Drink.Life.Love. Top Chef threw its all-star chefs into a museum with a bunch of elementary school-aged children and split the chefs into dinosaur categories — meat eaters and “veggie-saurs.” Being omnivores ourselves, we were torn as to which category we’d choose to cook from. In the end, Bravo.com’s cursedly limited selection of recipes kind of decided for us. Though he was castigated for making the sauce too salty, we went with Tre’s salmon and shrimp with apple smoked bacon sauce with the vow that no salt would be added. This one requires some planning ahead and, if you follow the recipe exactly, also does not include salmon. Way to miss the main ingredient Chad the Bravo intern! Now that we’re hitched and living in the same space and, for the first time ever, have a lot of weeknights free to spend together we’ve been planning our meals ahead each week. We knew we needed shrimp shells for this recipe so we went shopping a few days before Top Chef Night and bought shell-on shrimp. We ate the shrimp a few nights before and saved and froze the shells for this recipe. Also, though it does not appear in the body of the recipe (just the title, oh…and the show) we purchased a big salmon filet. K chopped up the bacon and started frying it up in a saucepan while I toasted the shrimp shells in one layer on a piece of foil in the toaster oven. Our observation: When the shrimp shells smell toasty and “done,” they’re done. We popped the shrimp shells in the pot with the bacon then threw in the paprika, garlic and onion powders and tandoori spice (though, if we make this again, I’d put the spices in before the shrimp shells). I had to keep stirring things up to keep bacon, shrimp shells and spices from burning. I tossed in the water and reduced (by half, I’m not sure, but close enough), then added the cream and let the whole mess simmer. As luck would have it, we also had a bunch of leftover fingerling potatoes and duck fat we’d saved from an earlier meal including duck breasts. Deciding that salmon and sauce does not a meal make, K sliced up some fingerlings and fried them up in duck fat. When the sauce was close to the finish line, he also fired up a saute pan and popped the salmon filets in. The deep coral filets quickly plumped up and turned an opaque honeysuckle color (nerdy Pantone reference) and I carefully picked shrimp shells out of the very hot sauce then strained the unpleasantly chewy bacon bits (and errant shrimp shell bits) out. No salt was added and the sauce was lightly toasted, with a hint of bacony smoke, a little bit spicy and silky. It was heaven over the meaty, tender salmon. The duck fat potatoes were crunchy and salty and not at all greasy. Perfect balances of sweet, meat and salt. An omnivore’s dream. Bonus: We had lots of extra sauce left over which we have frozen, will reheat and put over a quickly sautéed salmon filet in the future.